Remember when only muscle cars had 390 horsepower? Of course you don't. 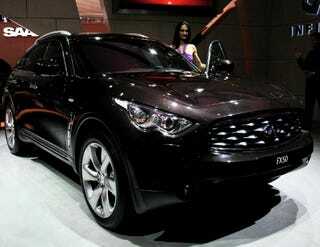 Therefore, it shan't give thee pause the new 2009 Infiniti FX50 has the same. That by way of Nissan's 5.0 liter V8 — that outpowers BMW's X5 4.8i — over a seven-speed transmission. Other than a significant facelift, the longtime oddball SUV gets a four-wheel double-wishbone suspension with active Continuous Damping Control (CDC); four-wheel active steering and intelligent brake assist. The most notable interior feature, other than the 11-speaker Bose audio system and active safety gewgaws like intelligent cruise control and Distance Control Assist (DCA), is the new 360-degree Around View Monitor system, shared with its smaller EX counterpart. The FX50 will hit the US mid-year before a European ship date in the fall, followed by stoplight-to-stoplight guffaws involving errant X5s in Basel.